How to get an AI internship? Machine Learning and Artificial Intelligence are some of the most talked about buzzwords of the day. If you are thinking about a potential career, studying either AI or ML is a very good idea. In fact, anyone who is in science, culture, business, government, or education, and wants to remain relevant, should be investing time and effort into learning all that you can about AI. Many companies are starting to see all of the benefits that AI can provide for their business. The technology is rapidly growing and companies that do not embrace it are going to find that they are far behind. The field is growing and in the future it is going to be involved in almost every field out there. This means that finding an internship to learn more about AI is going to become easier as there are going to be many companies that are offering people the chance to learn more about the technology and eventually work in the field of developing new forms of AI that can be used to improve areas of the business. When it comes to finding an AI internship you should first consider what area that you want to learn more about. There are AI internships available in many different industries. Some options include medicine, transportation, software, telecommunications, etc. Of course, there is a high demand for engineers and data scientists, especially in sectors that are data intensive such as insurance and finance. Once you have decided what sector that you would like to explore, it is time to search for a perfect internship. You can use our job board in order to find companies that are looking for AI interns within the industry that you have decided on. Another option is to discuss internships in AI with your educational advisor. There are several companies that contact colleges looking for students who are interested in internships. Make sure that you discuss all of your options with your advisor as they may have leads that you will not find on your own. In order to get accepted for an entry level machine learning job, we should talk about Kaggle. If you are serious about artificial intelligence take part in their challenges and document your work. Github is the perfect platform for this. Talk about your projects in your resume to show the employer your talent. This will help you compete against other candidates. Also, you need to be able to read research papers, or better, even write research papers. You will find more on that topic on YouTube. If you took part in one of the many AI courses, make sure to attach the certificate to your job application. This is a bonus, but it might make you stand our from the rest: create a personal website showing your work, projects, publications and code. 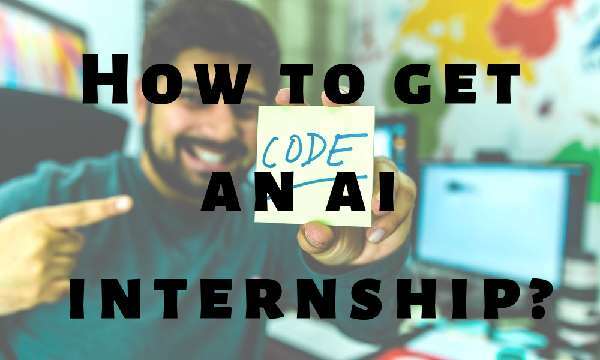 When it comes to finding an AI internship the best thing that you can do is to research all of the options that are available. When choosing a company to intern with, make sure that you are truly interested in what they have to offer. Things you need to know when starting as an AI engineer!